Soccer is a popular sport among children, for both boys and girls. Participating in soccer can teach kids the value of teamwork while providing needed physical activity; however, it is also a sport that comes with its share of injuries. For parents of soccer players, the goal is to be aware of the types of injuries that can occur and how to prevent them without dampening your child’s enthusiasm for the game. The most common injuries that can occur in soccer are lower body injuries, due to the constant running and sprinting that is involved. These injuries can include sprains and strains to the calves, ankles and feet. 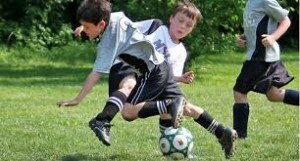 A child may also experience hip or lower back pain after playing soccer. These injuries deserve extra attention in children as their bodies are still developing and the impact of such injuries may interfere with proper growth and development. Lower body strains are typically treated by applying cold compresses and resting the affected joint. However, if this fails to provide relief a Chatfield Chiropractor can use effective techniques to make adjustments to the affected area. These adjustments can promote healing by restoring proper use of the joint and easing discomfort. We also offer soft tissue therapy & rehabilitation to ensure comprehensive care is provided. A common soccer move which is often used is “heading“, which means that the head is used to hit or direct the ball. This move carries a high risk of possible head or spine injury and should only be practiced when a child has been given proper coaching on the technique. Some doctors recommend that the technique not be used at all by children who are younger than 10 years old until the spine has developed further and is better able to handle the impact of such an activity. 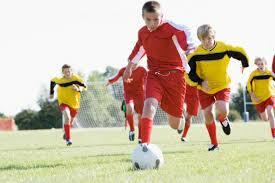 There are many things that parents can do to help protect their child from soccer injuries. To begin with, parents can ensure that their child has the proper protective gear, such as shin- knee pads, mouth guards and the proper footwear. Equally as important is the gear your child uses when playing the sport. Parents should request that the goal posts be padded and that smaller balls are used for younger players, so that any impact or injury can be minimized. It is always important to have a coach, team manager or parents that have proper sports first aid training to make sure injuries get the attention they require. Dr Daniel regularly volunteers with first aid at the Sunbury United Soccer club!.